By Peter Anderson 35 Comments - The content of this website often contains affiliate links and I may be compensated if you buy through those links (at no cost to you!). Learn more about how we make money. Last edited December 3, 2017 . Earlier this week in response to a post online I posted a list of “10 People All Personal Finance Junkies Should Follow On Twitter“. The idea was to let people know about some must follow twitter users in the personal finance blogosphere who consistently make useful twitters, both about personal finance and other topics. The response to that original post was surprisingly good, it was picked up on Stumbleupon, as well as some other social media. Once word got out about the post other personal finance twitter users started adding their twitter IDs to the list, until this morning when the post reached 40 comments. I thought that this morning I would do a follow up post that includes the Twitter IDs of all the personal finance junkies that came to the post, as well as a ton of other personal finance users that I follow on twitter. The idea was to make this post the go-to resource if you're getting started on twitter, and you're interested in personal finance. Just follow all these people, and you'll be off to a great start! In fact, you'd be off to a better start than I was a few months ago. 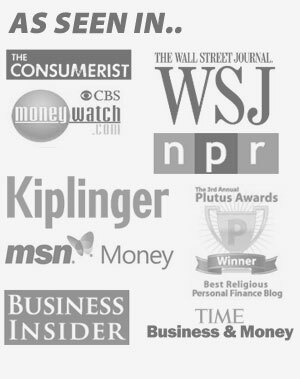 So without further ado, here are 125 more twitter using, personal finance junkies! 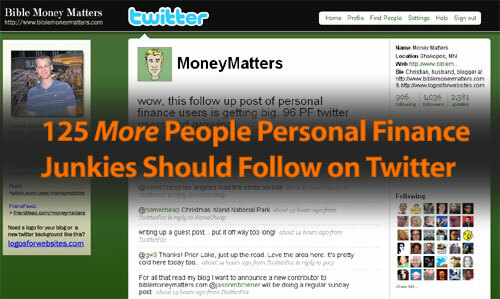 Update: Click here to view the new 250+ personal finance users twitter list! As I mentioned in the other twitter post, if you're not in the list and want to be included, just leave a comment below with your twitter ID and we'll add you onto the list in a future update. Thanks, and enjoy twittering! Quick Twitter Tip: To get a quick following, and a good user base, find someone who is interested in a topic you like, like personal finance. Follow the people they follow. You'll be able to get a nice number of twitter followers interested in the topics you're interested in because many of the people you follow will follow you right back! Check out our new Personal Finance Twitter list that inclues all 125+ of the names above, plus another 125+! Click here. Thanks so much for including me in your list! I’m going to check out the others and see which ones I’m not following yet! God Bless! Thank you so much for including me in your list! I’m not even following half of these PF bloggers. Time to hit some “Follow” buttons! Thanks for the list! I have some work to do seeing who I might not be following. I think it’s real important for people to follow your top five people especially the one between 3 and 4 ;)! you are a mad-twitterer! Thanks for the mention and now I am off to start following about 100 more people!! Thanks for including me here! I have a website and tweet additional offers, coupon codes, & freebies on twitter http://twitter.com/MomsWhoSave Glad to see people are taking notice of the offers and information all of us are putting out there. Sniff…I didn’t make the list! But I’d love to be added in the future. I tweet about money and entrepreneurship. Follow me in particular if you’re starting or running a small business! Add me to the list. Not strictly PF, but F for sure with some P in it. Thanks for the include!!! What an awesome list. Much appreciated. I wish to be included in the list. I feel so left out…. The obligatory comment to add me. Thank you. See you all in the twitterverse! Greg / Wise Breads last blog post..Are you a telecommuter paying commuter rates for auto insurance? Follow both my blog on personal finance from a Christian perspective as well as cheap travel tips. Would love to join the list!